The experts say the greenhouse gases we’ve put in the atmosphere will affect global climate for the next several centuries. Where will we be 500 years from now, once this pulse of carbon dioxide has been drawn down by the seas and soil? What will the post 500 world look like? I’m fond of talking about the deep present, the idea that we should run society as if any natural event that’s happened during the last 10,000 years or so, not just recorded history, could happen again tomorrow. But for the greenhouse pulse the deep present is no guide, because the world hasn’t seen its like for millions of years. The greenhouse pulse has shoved us into the Anthropocene age in which, like it or not, humans are a large-scale geological force. The Anthropocene world will be an ad hoc world. Post 500, the sea will be tens of meters higher than today, but once we have the means to regulate the climate I suspect we’ll keep the sea where it is, for stability’s sake. I don’t see us bringing the glaciers back unless there’s an existential need. Some aspects of the future are sure things. I am sure we’ll still be scrambling to deal with the damages we’ve done to the natural world we inherited: the ruined aquifers, the risen seas, the climate out of equilibrium, the ecosystems lost or knocked askew by extinctions and invasives, the metal ores depleted, the billions of holes we’ve made in the ground. It’s harder to imagine the state of human society post 500. Look back 500 years to 1517 — the Portuguese empire was pushing into the Spice Islands and the Magellan expedition, the first to circle the globe, was still being organized in Spain. Modern science was many generations ahead. It makes me uneasy to say this, but unless the human population can be reduced to Earth’s carrying capacity, perhaps one-tenth its present total, we’ll need to engineer fully artificial living arrangements that don’t affect the rest of creation. If you like, call that a zoo for humans. If you like, call it the terrestrial version of a Moon base. It will have to be so good we’ll want to live that way. We’re already getting there. We will need to minimize our wasteful, precarious agricultural system based on pesticides, fertilizer and soil. To save the world’s plants and animals from widespread extinction we will need to stop encroaching upon their environment — not just stop, but withdraw. Surely the post 500 world will differ wildly from ours. But the seeds of that world are sprouting today. In the past 500 years we have mastered matter, and in the next 500 I anticipate that we’ll master biology and recycling. We will no longer use fossil fuels, and we’ll do much less mining on Earth than today, if any. We’ll undam most of the rivers and heal the coral reefs. 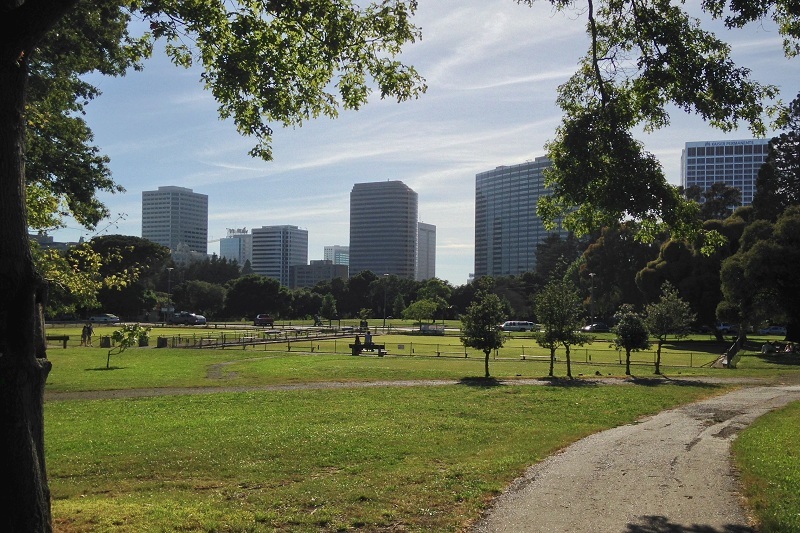 Why do I bring up all this in a blog on the geology of Oakland? Because we’re building the post 500 world now. Look at the 50 years just past, and imagine that degree of change and progress over the 50 years to come — even as sea-level rise starts to really kick in. The next 50 years is the first one-tenth of the next 500 years, and the most important part. Progress will require knowledge of the Earth and the confidence to apply it. Thus Earth scientists will be central as we make our way. 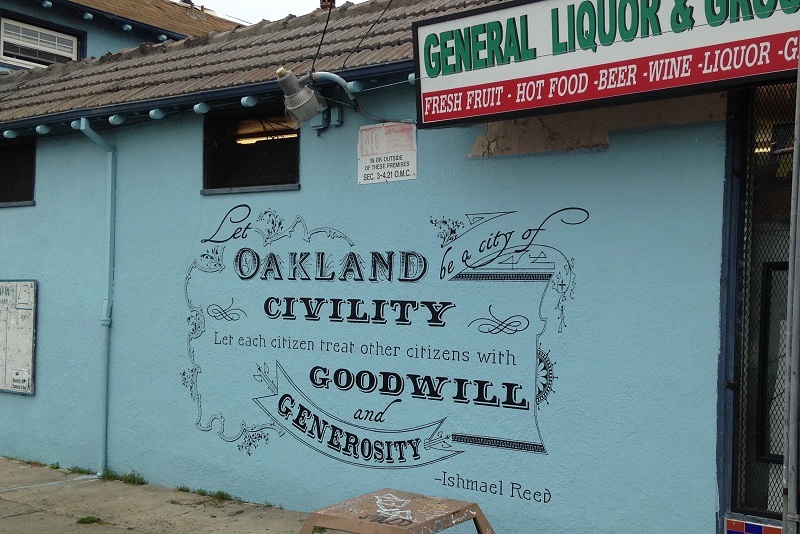 And Oakland will endure; it’s too important not to. Mass transit will gain ground as population density increases. As the sea rises, we’ll raise our harbor and airport and rail lines, even if they end up on plateaus. We’ll restore the salmon run up San Leandro Creek, and our building stock will improve as we go through repeated earthquakes, rebuilding higher each time. Those are sure things, and they can be done right if we insist. What matters is our culture. What we do today, and how we do it, will make all the difference on our way to post 500, the year 2517. This entry was posted on 9 October 2017 at 8:02 am and is filed under Other topics. You can follow any responses to this entry through the RSS 2.0 feed. You can skip to the end and leave a response. Pinging is currently not allowed. I’m a bit more optimistic about the Anthropocene- I think we’re seeing the end of fossil fuels, so I’m hoping that global CO2 levels will start dropping by the end of this century. The progress in renewable energy, energy storage and energy efficiency has been dramatic over the last 30 years. They’re even starting to work on battery-powered planes. I’m working on solving the problems with lithium-air batteries, which would be another big leap forward in what batteries are able to do. Lithium ion batteries have already started to transform the energy landscape. it’s so nice to see some optimism amongst the crazy sh_t happening in this country today. thanks! Of course thanks to the Hayward fault Oakland will have a rapid urban renewal event in the next 500 years (perhaps several) leaving just the street grid when done. It is sort of like the 1906 urban renewal event in San Francisco which did some urban renewal in Oakland also. I have thought about this – some say too much – five hundred year plan for a goal of retaining as much as fifty percent of all rain and snow melt water before it enters the oceans. Looked at from an extraterrestrial point of view, the planet may be better off when the human race has made ourselves extinct, which could occur a lot sooner than 500 years, alas. Not that I mean to be pessimistic, really, and I appreciate your column for its optimism. But breathing ashes today, I’m thinking we are likely already crossing the line of viability for our species. Thank you for this brave departure from geology per se. Thank you – This was much needed. I hope some of what you predict comes to pass.